CEMRC operates two fully automated identical meteorological towers at sampling sites in the vicinity of the WIPP. 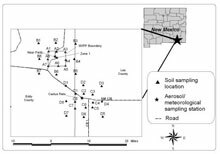 The Near Field site is approximately 1 km northwest of the WIPP site at an elevation of 1088 m (latitude 32°22’40.385”N; longitude 103°47’55.425”W). The Cactus Flats site is approximately 19 km southeast of the WIPP site at an elevation of 1041 m (latitude 32°13’05.451”N; longitude 103°41’42.583”W). Each station consists of a 10-meter tower equipped with sensors for temperature, relative humidity, barometric pressure, total solar radiation, Ultra-Violet B (UVB) radiation, wind speed and direction, and vertical wind speed. Data are collected every second, with averaging times of ten minutes. In addition, the maximum wind speed and total precipitation occurring over the 10-min averaging period are recorded. Details concerning the sensors and operation of the equipment are presented in the 2000 Annual Report section on meteorology. 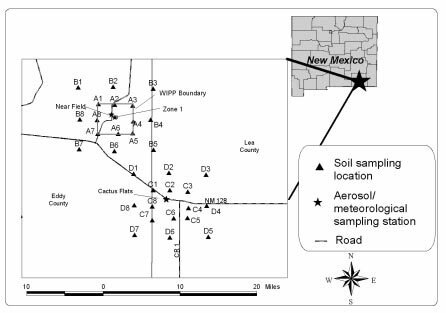 The data derived from these stations is essential to interpreting results from other parts of the project, particularly the aerosol studies. For example, notable short-term changes in aerosol compositions can be evaluated against wind direction to determine if there were a possible difference in source terms.